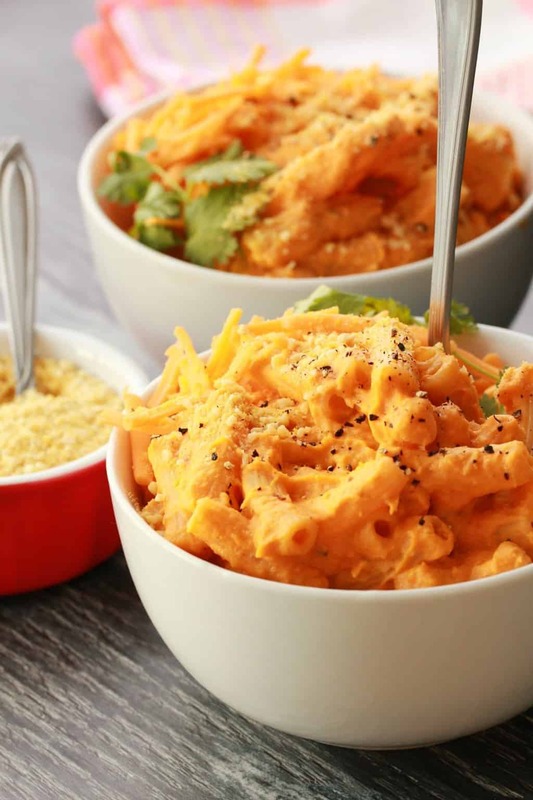 Fabulously cheesy vegan butternut squash mac and cheese. 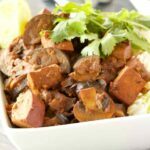 Perfect comfort food, this saucy and deliciously flavored dish is super easy and so satisfying. 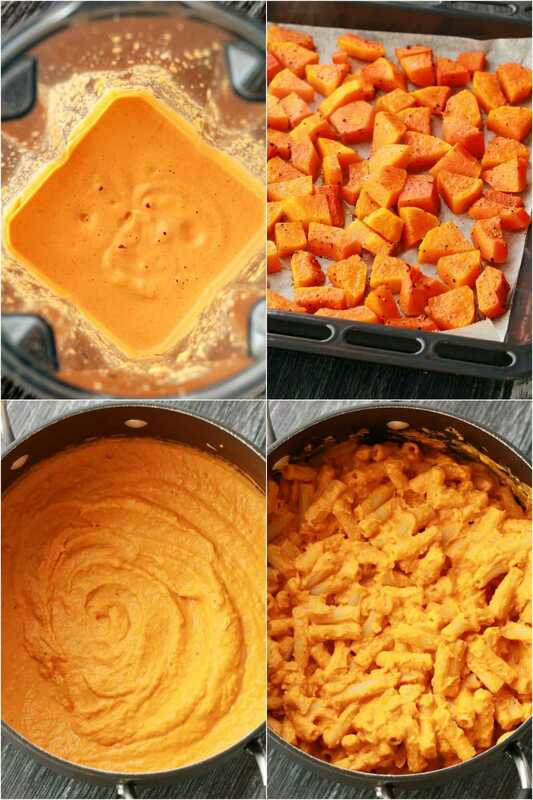 Mmmm vegan butternut squash mac and cheese! 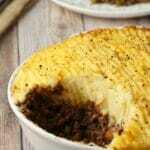 It’s amazingly cheesy and hearty and comforting. The perfect comfort food really. 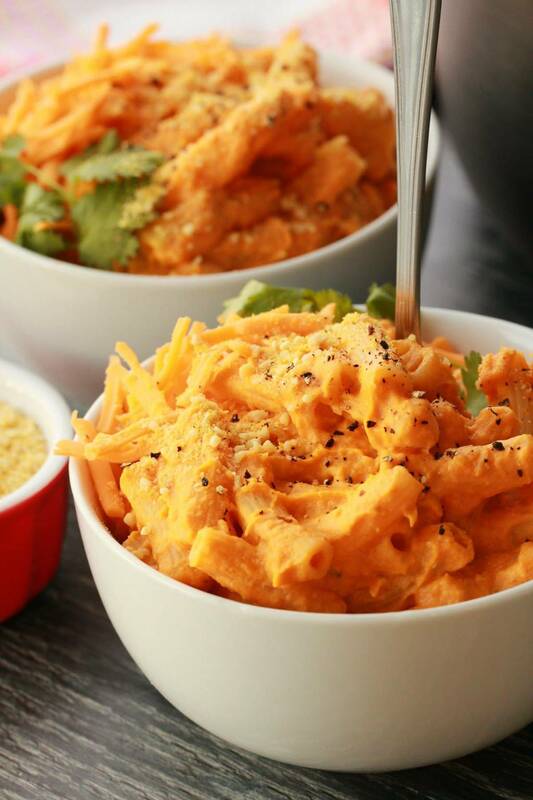 This vegan butternut squash mac and cheese is everything you want it to be! It’s cheesy, saucy, creamy, rich and satisfying. Roasted butternut squash is blended with a fabulously spiced cashew cream cheese sauce and some cooked onion and garlic and this is how the magic happens. And you will seriously not believe how cheesy this is! But oh my – it is. The whole meal comes together in less than an hour and really, it only takes that long because you roast that butternut for around 35 minutes until it is beautifully roasted perfection. Can I adapt this recipe for gluten-free? You absolutely can, it’s super easy to do. All you have to do is use a gluten-free pasta and you’re done! 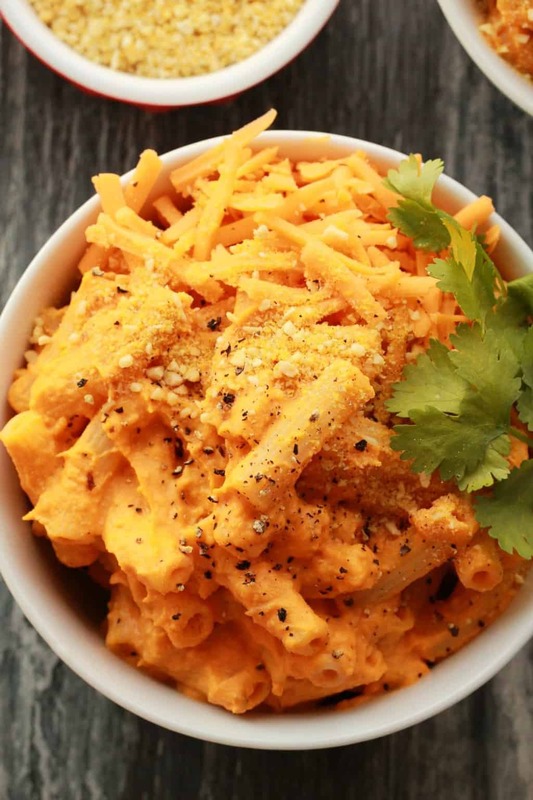 The cheese part of this macaroni and cheese is already gluten-free. Can I turn this into a baked butternut squash mac and cheese? You sure can. 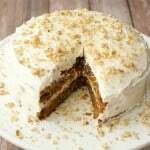 If you want to bake this, it would be divine! 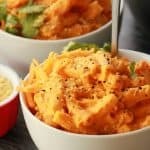 Instead of serving it right away, transfer it into a 9×13 baking dish, top with some vegan cheese or breadcrumbs and bake for 20 minutes at 400°F (200°C). What is the nutritional yeast for? 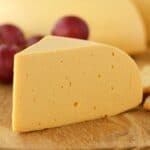 The nutritional yeast creates a cheesy flavor. 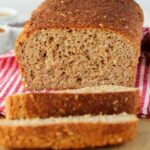 It’s completely different to a regular yeast that you would use in baking breads. 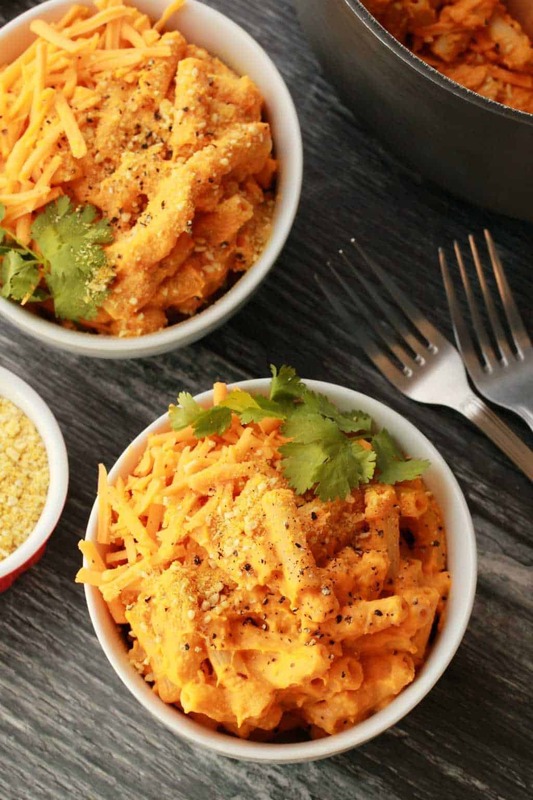 Nutritional yeast is a cheesy flavor bomb and it’s delicious. 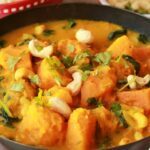 However, we do also create cheesy flavor here with the cashews and butternut squash so you can leave it out if it’s really hard to find where you are, or if you don’t like it. Serve with some grated vegan cheese and/or some vegan parmesan cheese sprinkled on top and some fresh cilantro. This is a dish that looks gorgeous and tastes even better! Even if you just serve it plain with no added vegan cheese or vegan parmesan cheese on top, it is still going to be ultra cheesy. 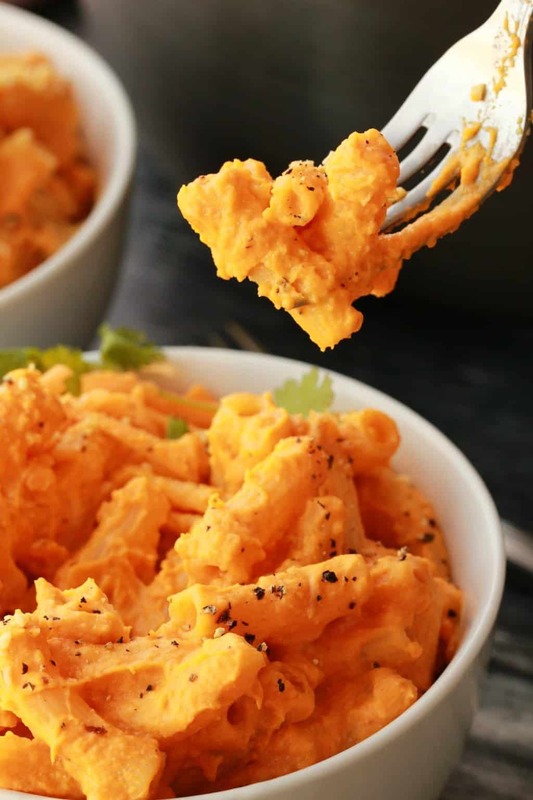 The cheesy flavor is created from the butternut squash and cashew sauce, you don’t need any extra cheese. 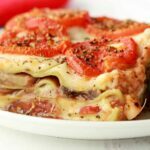 Leftovers keep wonderfully in the fridge and can either be reheated the next day for lunch or enjoyed cold (it’s super good!). So definitely make the full recipe even if you’re not serving many people, you’ll be grinning to yourself over the next few days as you enjoy the leftovers. 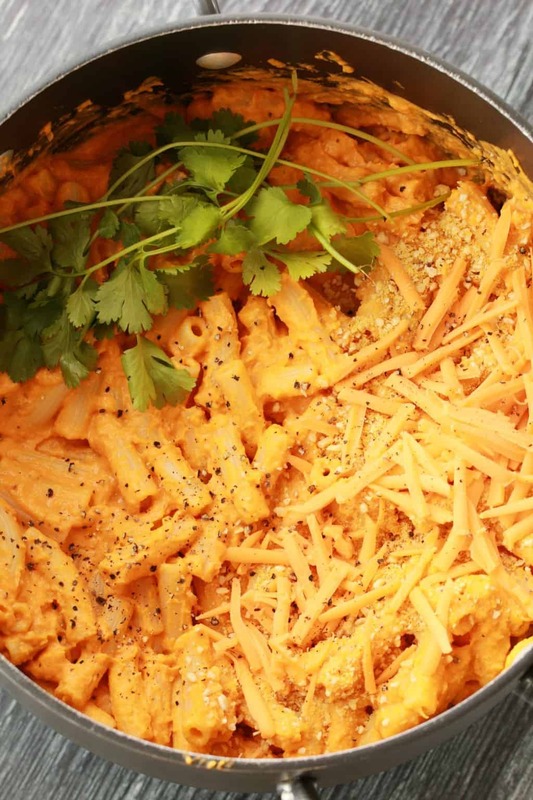 So what do you think of this vegan butternut squash mac and cheese? I hope you’re very very tempted! Don’t be tempted, just go ahead and make it! And please rate the recipe below and let us know what you think. 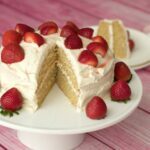 To stay updated with all our latest recipes posted to the blog, definitely sign up to our email list! You’ll also get a free (awesome) ebook! Peel and chop the butternut squash and then add to a bowl with the olive oil and salt and pepper and toss so that all the pieces are lightly coated with the oil. Transfer to a parchment lined baking tray and bake in the oven for 30-35 minutes until soft and cooked. While the butternut is baking, prepare the pasta according to package directions. Once cooked, cover (to stop it from drying out) and set aside. Add the onion and crushed garlic to a pot with the olive oil. Sauté until softened. Leave it in the pot you will come back to it later. Prepare your cashew cheese sauce by adding the cashews, nutritional yeast, garlic powder, salt, water and paprika to a blender jug and blending until smooth. When the butternut squash is cooked, add it to the pot with the onion and garlic and toss together. Pour over the cashew cheese sauce. Use an immersion blender to blend it up into a smooth sauce. If you don’t have an immersion blender then add to your blender jug in stages until perfectly blended and then return it to the pot. Add the cooked pasta and mix it in with the sauce. 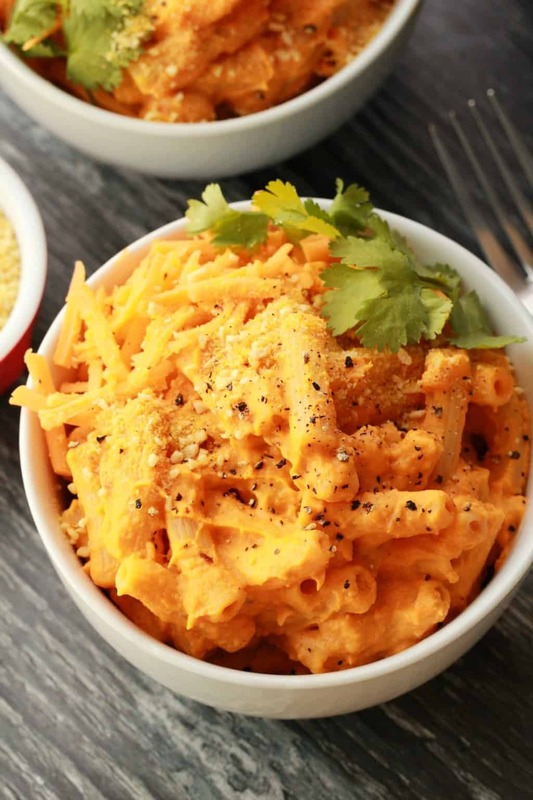 Serve with some grated vegan cheese, black pepper, vegan parmesan and fresh cilantro. 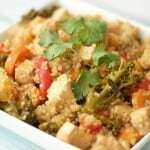 *Keeps very well in the fridge and can be served cold the next day or reheated as you prefer. *You can easily adapt this recipe for gluten-free, just use a gluten-free pasta. 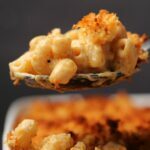 Amazing and fabulously cheesy mac and cheese! Made this as a treat and it was delicious I added broccoli to.